South African fears for Mandela’s health eased when news broke the 92-year-old had been released from hospital and was “well”. 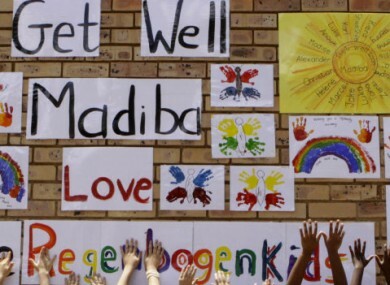 Children reach up to wish Nelson Mandela, or 'Madiba', well before his hospital discharge today. NELSON MANDELA HAS BEEN discharged from hospital and is recovering from a chest infection, according to doctors in South Africa. The former South African president and Nobel Laureate spent two days in hospital receiving treatment for a respiratory infection. South Africa’s surgeon general, Vejaynand Ramlakan, said the 92-year-old is in good spirits and “is well”, the BBC reports. Ramlakan said Madiba, Mandela’s clan name, was responding well to medication but his condition would be closely monitored. Mandela has repeatedly suffered chest infections since his period of detention at Robben Island, where he contracted TB. He retired from public life in 2004 and his last public appearance was during the World Cup in South Africa last July. Reports that Mandela had been admitted to hospital sparked nationwide fears he had died, and news of his release was greeted with widespread relief, the Guardian reports from Johannesburg. Email “Nelson Mandela released from hospital ”. Feedback on “Nelson Mandela released from hospital ”.